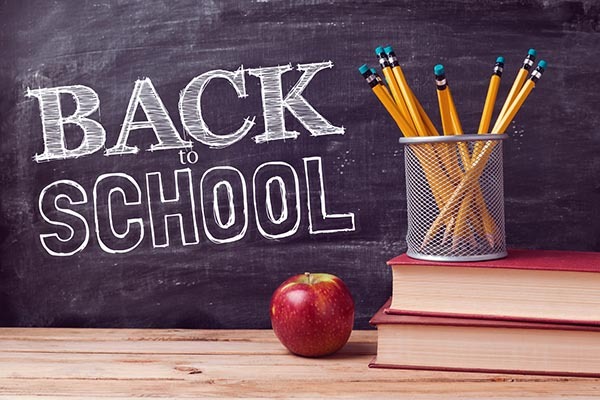 As the summer wraps up and our younger generation heads back to school, the printing and related industries are getting ready for their own education. Now begins the annual parade of executives, managers, and our best and brightest employees, leaving behind the daily grind of the office and production floor to attend one or more dazzling events and marvel at and learn about the latest technology for putting ink on something. It’s trade show season, a good time to pause and take stock of the changes occurring in the industry. As readers of The Target Report know, we view the industry from the perspective of transactional activity. 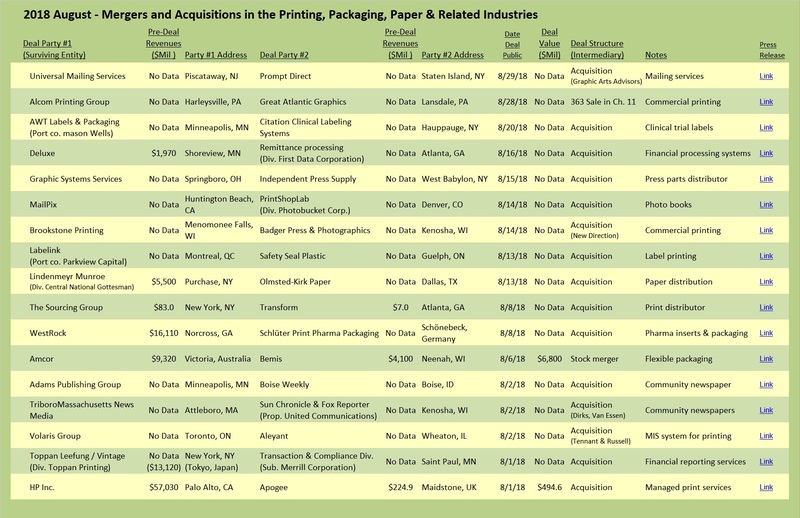 Over the past seven years, we have reported on the robust merger and acquisition activity in the printing, packaging and related industries. In some segments, that actively tells us that opportunities are excellent and well-heeled buyers are seeking to put their capital to work and invest in growing markets. Conversely, significant transactional activity in other segments, especially when correlated with data on bankruptcy filings and plant closures, is a very good indicator that the collective market place is getting tougher and owners are deciding that it’s time to exit. We went back to the data we have collected and reported to you over the past two years; we reviewed, categorized, sorted, counted and charted that data. One thing became abundantly and surprisingly clear—the trends are amazingly consistent year-over-year (albeit with a few exceptions) even to the extent that we logged exactly the same number of merger and acquisition transactions during the trailing twelve-month periods (“TTM”) ended August 31 in each of the past two years—227 to be exact. 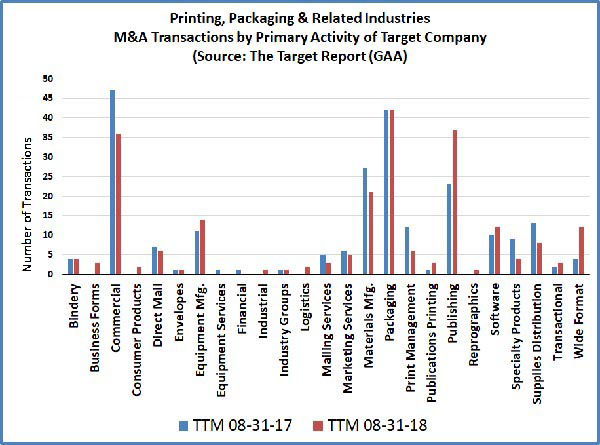 As we have often discussed in previous Target Reports, general commercial printing companies consistently rank high in the number of deals announced, followed closely by packaging companies (labels, folding cartons, flexible packaging, and corrugated cartons). Activity in the wide-format segment increased notably this past year—and when financial data was disclosed, several deals in the wide-format segment sported multiples about two turns higher than their cousins in the offset commercial printing segment. In the publishing segment, activity was brisk and increased this past year compared to the prior year, mostly driven by deals in which community and regional newspapers changed hands. When we looked at the seasonality of transactional activity, as shown in the chart above, the two past years differed notably in October, with a pronounced dip right before 2016 presidential election and a bump up in the same month the following year. June of this year was, for unexplained reasons, particularly quiet and tied for the lowest deal count in any one month since we began researching and writing The Target Report in 2011. Inexplicably, June of the prior year was the most active month we have recorded. As noted earlier, transactional activity tells us that change is afoot, but is that activity indicative of positive or negative change? To try and answer that question, we track and look at both the number of bankruptcy filings and the number of non-bankruptcy plant closures. Since very few companies in our industry survive a bankruptcy filing, especially the smaller companies, we can safely state that most of these companies ended up closing and the residual revenues flowed to a stronger competitor, either through a tuck-in transaction or via general marketplace assimilation. Many of the bankruptcies we noted were Chapter 7 filings, in which a trustee is appointed, and therefore we know that those companies were liquidated with no opportunity for survival. 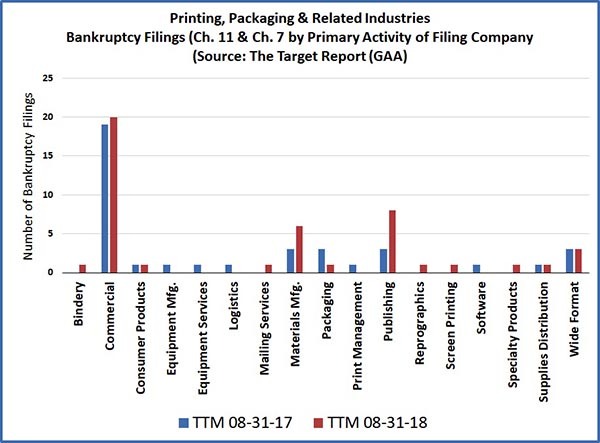 As we can see from the data, general commercial printing companies lead the pack with the most bankruptcy filings, year-over-year. We also note the negative implication for the publishing industry when we correlate the bankruptcy data with the number of M&A transactions. 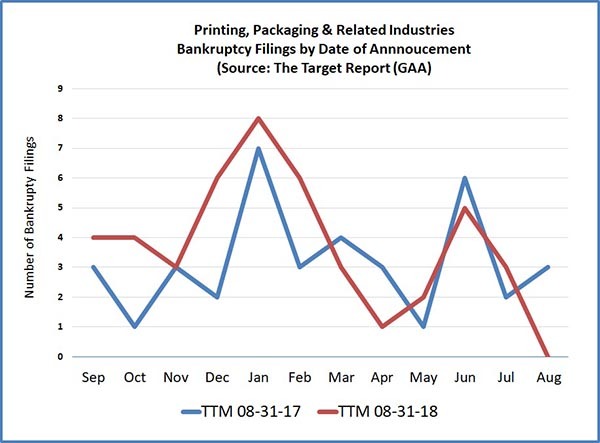 We have started to see some bankruptcy filings in the wide-format segment (one of which this past year was of significant size), indicating that the “bloom may be off the rose” and the market for wide-format printing services is getting more competitive. The spike in the materials manufacturing category was driven by both paper and ink companies filing. 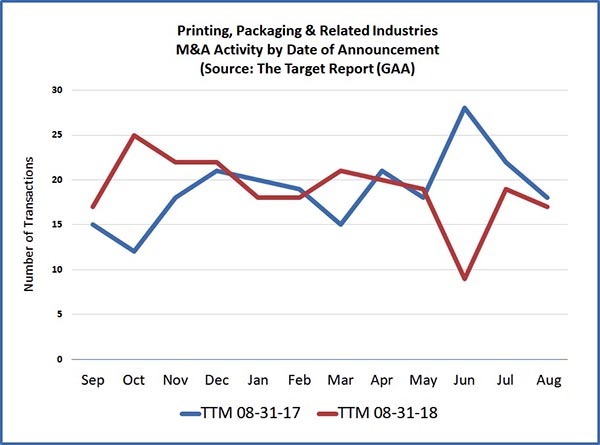 There were very few bankruptcies in the packaging industry segments, indicating that the robust M&A activity is a sign of positive momentum for packaging. We also track activity in non-bankruptcy plant closures, in the chart below, which may or may not mean that the company is closing (the big consolidated printing companies, Quad and RRD, for example, close plants to rationalize production capacity, but the company goes on). Again, sadly, general commercial printing companies are far and away the leaders in closing printing facilities this way. As might be expected, several binderies, book printing and newspaper printing companies closed up shop. We also took a look at the seasonality of bankruptcies and non-bankruptcy closures. 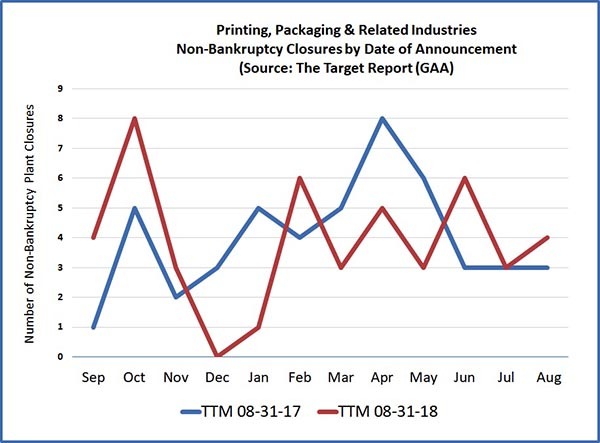 As we can see in the chart below, printing companies overwhelmingly file bankruptcy right after the new year and at the start of the summer season, both times when collectible receivables are likely to be higher after the typically busier seasons for printing companies, and before the winter or summer doldrums bleed cash from a struggling company. And lastly, below is the picture of how non-bankruptcy plant closures occur on a seasonally-tracked basis. 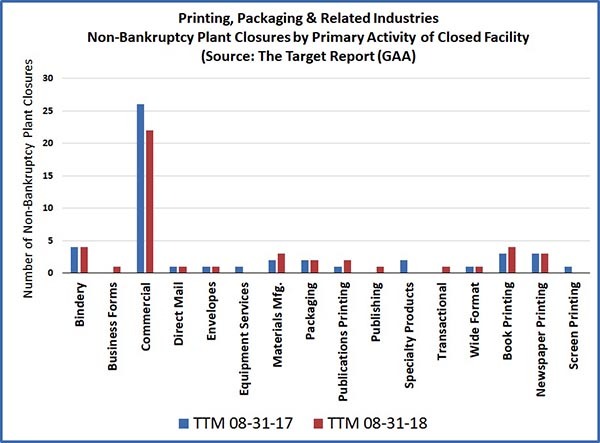 Interestingly, a different pattern emerges in these closures, as compared to bankruptcies, with clear peaks occurring right in the middle of the times when most printers are busiest. A good assumption might be that these companies were hopeful that the busy season would produce sufficient cash flow to save the day, but the work was not enough to fill their coffers and they simply ran out of gas.